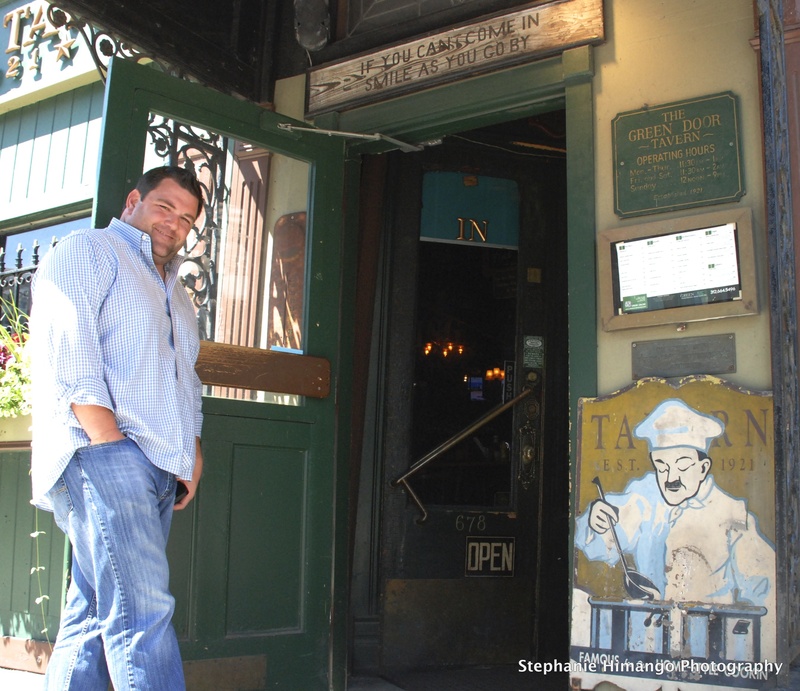 It’s Jeff Lynch’s third day behind the bar at the Green Door Tavern. He glides back and forth from tap to register, at once jovial and relaxed. His usual title is general manager, but today he’s pinch hitting as bartender. A Reds fan and Cincinnati kid born and raised, Jeff studied accounting and moved to Chicago in 1999 after landing a job in real estate. Later, the company Jeff worked for bought the Green Door Tavern. 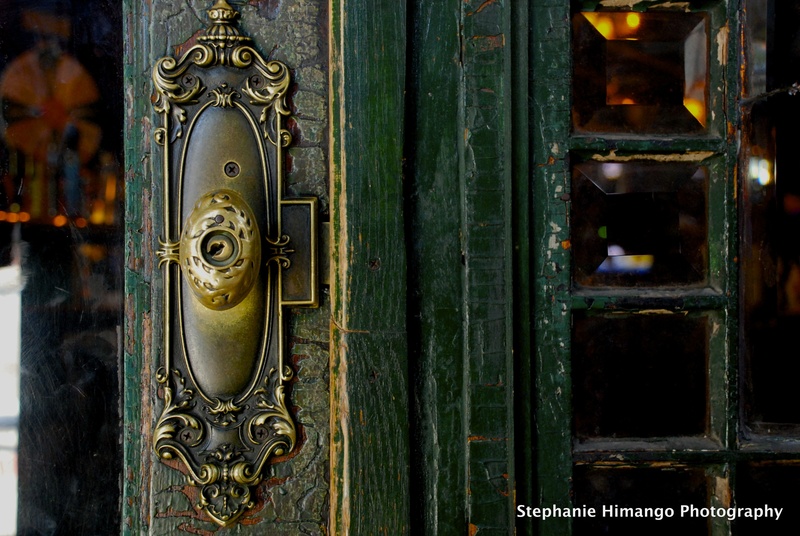 Once you’ve passed through the crooked original green door bearing the number 678, you’ve already time-traveled. The vibe is relaxed, yet lively, and the decor is sort of clean country cabin meets antique controlled chaos. Signs, billboards, pictures, mirrors, lamps, wooden bar, pool table. It’s very cool as a stand alone, but it’s the basement below that tells the full story of the green door. Go down the back stairs and you’ll find giant antique circus canvases and artwork in faded hues that will transport you to an era long past. Leather saddles drape the small wooden stage railing and dramatic lighting makes you feel you’re in an establishment once forbidden. For a time, that was true. Prohibition gave birth to a liquor-producing underworld and the advent of the speakeasy. Some say there is truth to the legend that mobster, bootlegger and florist Dean O’Banion’s North Side Gang hung out in the space beneath the Green Door Tavern. That may have ended when bad blood between O’Banion and the Chicago Outfit run by Johnny Torrio and Al Capone led to O’Banion’s murder … as the story goes … shot dead as he cut chrysanthemums in his flower shop near the Holy Name Cathedral. “It is one of the best private party rooms in the city. Has to be. You’ve got the atmosphere and the decor and the history. “My wedding was actually here!” Jeff is quickly back to his 2012 wedding to wife, Sue, who he met at the Green Door. Jeff is nodding and smiling, proud yet humble. He pulls two draught beers for a couple of sun-baked Australian guys who belly up to the bar and make a day of it at the Green Door. So much for the other places on their pub crawl. They found everything they wanted in this old place. The Prohibition-era mobsters make for a rich historical fabric, but there’s more. “It was built after the fire …” says Jeff, referencing the Great Chicago Fire of 1871. You may recall, that deadly blaze started one October night in the barn of Patrick and Catherine O’Leary. By the time it was over, according to the Chicago Historical Society, the heart of the city was devastated, at least 300 people had died, 100,000 people were made homeless and $200 million worth of property was destroyed. “After the fire …” he continues, “… and before the ordinance that said you can’t have free-standing commercial wood structures in downtown Chicago. “In the middle of high rises and million dollar condos, night clubs and fancy bars, we’re just a regular old place. And that is the key to us. Some say it’s Chicago’s oldest establishment — but that is up for debate, and for many people, it’s just semantics. “We’re the oldest tavern, for sure,” says Jeff. Some say the Berghoff carries that distinction. “I think they’re older, but they are not considered a tavern. Country music filters through the room this Tuesday afternoon, mingling with iconic posters of Marilyn Monroe, neon signs, college team banners and stuffed hunting prizes. As my eyes scan the room, the walls seem to rise and fall a little with each new discovery, like a living breathing document, one that holds secrets from the past while registering new information daily. “Some people call us a dive bar. Some people call us a neighborhood tavern. Some people call us a saloon. We’re just here. “We’re just here serving you drinks and food, and it’s a nice place to relax. You don’t need to dress up. You don’t need to be crazy. As I make my way toward the green door leading back onto Orleans street, a favorite and fitting country tune walks me out…..
Goodbye. Farewell. So long. Vaya con Dios. Good luck. Wish you well. Take it slow. Easy come, girl, easy go. 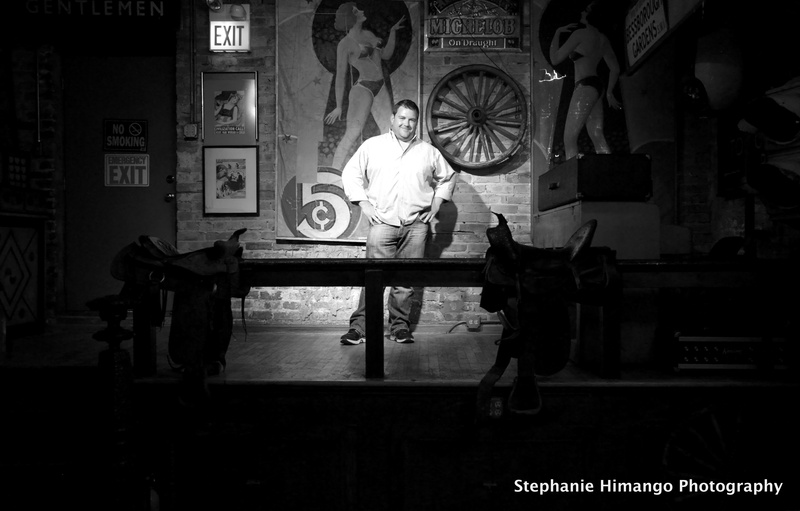 This entry was posted in Travel and tagged bars, business, capone, chicago, doors, green door, history, mobsters, o'banion, restaurants, taverns by Stephanie Himango. Bookmark the permalink. Well done, Stephanie! Love the pics! The Green Door Tavern sounds like our kind of place….and if they play George Strait, I’m there!